1/3 c. of water or aloe vera juice (you can warm it a little for easier mixing). You may use more or less as it should be the consistency of pancake batter. I then poured it into a bottle (must get a funnel for next time!). I applied the mixture to my dampened hair and scalp. I saturated my hair with the clay wash and rubbed it into my scalp. The basil and tea tree oils are stimulators, so it felt tingly! After applying, I put a plastic baggy on my hair and allowed the wash to perform magic on my strands! You can see from the picture that when I finished, I pinned the sections with bobby pins. Afterward, I applied my leave-in and styled per usual. Now… this “shampoo” really does remove any product build up from your hair. You may not even know that you had any especially if you’re using products with silicones. 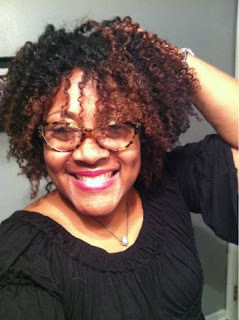 For me, the wash encouraged my shrinkage (see the pic above) but left my hair clean, soft and shiny. I loved it and will do it once a week as I long ago abandoned shampoos. They leave my hair feeling stripped and dry which is why I mostly co-wash. Below is the twistout I got after styling. It’s full of shine, body and bounce! That’s it folks! Will you or have you given mud washes a try? Share what were, or are your results! I will definitely give it a try once my water issues are resolved and I can take a real shower!!! You are so creative Lynne. Loved your story and thanks for sharing!